How unlucky for perfume lovers to live in an era when Mysore sandalwood has disappeared from fragrances. Let’s hope the over-harvested and endangered sandalwood trees of India are truly being protected and propagated for future generations. According to Serge Lutens P.R., the company bought its stash of Mysore sandalwood before stringent trade regulations went into effect, and it’s this “legal” Mysore sandalwood that supposedly enriches the Lutens perfume of the same name. Santal de Mysore was developed by perfumer Christopher Sheldrake and released in 2001. I never smelled “original” Santal de Mysore so I don’t know how it compares to the new, surely reformulated, fragrance. Today’s Santal de Mysore contains, apart from Mysore sandalwood, “spices,” cumin, styrax balsam and “caramelized” Siamese benzoin. Santal de Mysore starts off smelling edible, with a nougat-y and coconut-cream sweetness emanating from a faint "wood" note. The wood/coconut note is spiced with powdery cumin (not too “sweaty” or “raw”) and perhaps some star anise and turmeric. The first phase of Santal de Mysore smells more like Santal de Bangkok — the scents of Thai curry and coconut custard. (I suspect Christopher Sheldrake is a great cook.) Slowly, the scent of light and talc-y sandalwood (tinged with vanillic benzoin) comes to the fore. Santal de Mysore is, overall, a delicate and smooth spicy-gourmand fragrance; it’s not loud, jarring or ‘glossy.’ Santal de Mysore smells “antique.” When I dabbed a few drops of Santal de Mysore on my wrist, it was love at first sniff, and I was about to reach for a credit card when my “Perfume Mentor, BS Detector and ‘Common Scents’ Advisor” (aka: Robin here at Now Smell This) whispered in my ear; she suggested I wear Santal de Mysore next to Serge Lutens Santal Blanc* before making a purchase — just in case I preferred Santal Blanc. I took her advice. Santal Blanc (brand new bottle) begins with the scents of aldehydes and tropical fruit jam (I’m visualizing soft, orange-yellow pulp); in mid-development, the fruit jam is joined by a “burnt bread” aroma. Santal Blanc’s base notes smell of clean, floral-fruity musk. Floating through the early stages of this fragrance are notes of cedar and sheer (and ephemeral) bleached/ “white” sandalwood. Santal Blanc smells modern, sleek and decidedly feminine; it is LONG lasting on skin and eternal on fabrics — it survived on my skin through three showers in two days and I had to have the wool coat I was wearing on "Santal Blanc testing day" dry cleaned to remove the perfume. I wouldn’t wear Santal Blanc if a bottle fell into my lap. But I’m glad Robin mentioned Santal Blanc because searching for and trying that fragrance kept me from making an expensive mistake. As I compared the two Lutens sandalwood perfumes, I no longer “dabbed” but poured on Santal de Mysore. When I wore the equivalent of 7-8 sprays of Santal de Mysore I recognized its flaw — its dearth of sandalwood, the fragrance I desired most of all. Santal de Mysore showcases curry spices and other food-y notes (cream, coconut, vanilla), but sandalwood, of Mysore or any other provenance, is a bit player in the formula. I still like Santal de Mysore but it seems overpriced. Serge Lutens Santal de Mysore has very good lasting power and mild sillage; it’s $200 for 50 ml of Eau de Parfum. For buying information see the listing for Serge Lutens under Perfume Houses. *official notes for Santal Blanc: white sandalwood, fenugreek, pink pepper, cinnamon, rose, jasmine, orris root, musk, benzoin, copaiba balsam. 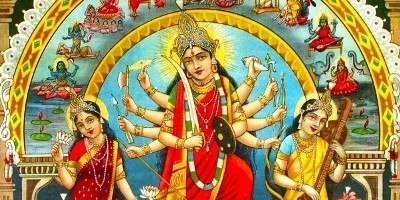 Note: Top image is Sri Durga as Mahishasura Mardini [cropped] via Wikimedia Commons. Midway down, images of coconut and vanilla bean also via Wikimedia Commons; cumin seed via Charles Haynes at flickr, some rights reserved. Thank you so much for your review. I love sandalwood, and have been wanting to try this, but it doesn’t ultimately sound like my cup of poison. Do you still want a try? I’ll stick it in your next package. After your armpit comment below, I’m not sure!! Well…. throw it in anyway. Now I have to indulge my curiosity. Miss K V: indulge and then decide…always nice to sniff something new anyway! Yes, try it. It smells great on my friend. All yummy and smooth rum/gingerbread/vanilla which is why I jumped in and tried it. . PdN’s Maharahih and L’AP Al Oudh do the same thing on me. I think it is the cumin. Now I’m always weary of Indian type scents that list “spices” because they almost all turn yucky on me. However, I do like the Santal Blanc. Well let’s see, I used to have Santal Blanc a few years ago but moved it along. Can’t say I remember why. Will have to retry the carded sample I have at home from a recent other purchase. The Santal de Mysore is def some potent stuff. I sniffed it awhile back. Although I loved it, I didn’t wind up buying a FB. Woudn’t mind owning a small decant. Hey Kev…does BS detector mean what I think it means…as in manure? HA! PS- I wouldn’t know what REAL SANDALWOOD smells like…if it fell into MY lap? I don’t think I would know it either—the only “mysore sandalwood” I’ve any experience with was DSH Mysore Sandalwood….which just smelled like dirty socks….from last months’ gym bag. But I passed it on to someone who loves it. Go figure. C: Robin doesn’t allow me to use “bad words” on the blog! HA! The marketing for Santal de Mysore annoys me…they are trying to justify the price ($60-80 over regular Serge Lutens perfumes) with the talk of “Mysore sandalwood”: so RARE, thus, so COSTLY! HA. I have let you use MANY MANY bad words. MANY. R: ok, a FEW! (especially the “A” double-S one. I’m glad you also thought sandalwood wasn’t the main player here; I thought I was missing something. I sampled this once and got just a bit of cumin, but mostly it reminded me of Sables, which has put me off trying it again. Janice: this one disappointed me when it came to “sandalwood” that’s for sure…but I’d buy it at $120-140. Hah! Unlike many others, on this one you and I will have to agree to disagree. Santal de Mysore smells like some sort of takeout food (Indian?) to me. Santal Blanc I wear a lot. I get that with Arabie–sometimes great, sometimes Indian takeout leftovers. Monkeytoe: if it’s take-out, it’s from a great restaurant…SdM is beautifully blended when it comes to the food notes. That’s certainly true! Santal de Mysore is about sandalwood the way that Cedre is about cedar. I got a sample from Luckyscent last month and gave it a run. I thought it smelled nice, didn’t get a strong cumin, nor really a strong sandalwood (as I know sandalwood from oils and such). It was more spice, benzoin and some balsam. Definitely more for a guy, but I didn’t really hate it or anything (then again, I am NOT scared to wear CdG Avignon or any other strong fragrance. So…it was OK, but definitely not something I would buy for myself or my man. Good for a test run though. Did last a long time. I purchased a large sample when this came out, and it smells like curry scented armpit on me. Apparently I can’t wear anything with cumin as it turns immediately sweaty on me. Cumin turns on me too. When I tried this I didn’t get cumin, I got CUMIN!!!!! It was not pretty. mostly fleur d’oranger does that HORRID cumin thing on me…but on the rare times it doesn;t….it is glorious! maybe the sensitivity to the cumin is a mood/chemical thing! I love Jubilation 25 and had no idea it had cumin in it until right now. Weird! When was the sandalwood regulation put in place? My bottle of Santal Blanc is from 04-05, I think. I wear it pretty often (hi March!) and I never think of it as feminine, but it is certainly less baroque than Mysore. Luten’s SdM always felt like it is from the Samsara family tree. Monkeytoe: don’t know that Santal Blanc ever had Mysore sandalwood in it, even in 2005. It certainly doesn’t have it in it NOW…$120. Somebody told me they never used actual sandalwood in it (my bottle is approx. the same age as yours). So, if neither of these impress you, what IS your sandalwood go-to scent Kevin? Rictor07: I have no sandalwood go-to now…all the ones I liked have been reformulated with Australian or faux sandalwood. Wonder if I’ll live long enough to smell REAL Mysore sandalwood in perfumes again? I hope so! Kevin, there’s a small shop in NYC’s SoHo neighborhood, named Erbe. It’s mostly a spa featuring their in-house, made-in-Italy skin care but years ago they did a series of edt scents, one of which was ‘Sandalo’. The owner/perfumer says it was Mysore sandalwood and while I can’t vouch for all that, I will say it’s stunning – rosy, milky, sweet, straight-up sandalwood. Because of all the restrictions, it’s no longer made, but I bought a bottle back in ’98 – after I witnessed someone come in and buy 6 bottles. All these years I’ve keep it tucked away in a drawer and knowing that I’ll never own another bottle, I rarely wear it – but every now and again I’ll take it out, just to sniff it and smile. Sayitisntso: ‘My god…I didn’t even know Erbe existed anymore…I LOVED their Sandalo! Yes, Erbe is still around. And you know what? I’d gladly send you the remains of my Sandalo bottle. Why? As a way to say “thank you” for educating us and making us smile with every review you contribute to NST. Consider it a not-so-random act of kindness. The bottle is about 3/4 full. Contact me directly at r j e p p p s atsymbol g m ai l dotcom. Kevin, here I think you’re going to say something nice about Santal Blanc then… WHAM. “Wouldn’t wear it if it fell in my lap.” Well, I like it and own it, but I don’t wear it often, and I don’t really think of it as a sandalwood in a category of its own. Quite a comfort scent though, and yes, tenacious. I read some comments that stated S d Mysore was basically all about garam masala. You’ve made it sound creamier, but basically, the huge lemming I had for this before Christmas was averted… and good thing at that price. I think I’ve mentioned my «Great Sandalwood Quest» of about a year ago, during which I ordered a good 5-6 samples of sandalwood fragrances. Sadly, I’ve still not tried that Profumum I think you’ve praised, but the best one I tried was Lorenzo Villoresi Sandalo. It was almost identical to a small vial of pure Indian sandalwood oil that I own. I’m still thinking about a bottle of that one, and I think I recently saw it on a swap friend’s list, so I may try to wheedle a decant. Highly recommended, that LV. Joe: I tried the LV LONG ago I believe when it probably had real sandalwood in it…as did Etro’s Sandalo when it first came out. I did like Profumum when I first smelled it and need to retry that and maybe get a fresh sample. Poor sandalwood…poor me! There used to be sandalwood in SO MANY fragrances of all price points. So true! Recently I decided to do a side-by-side comparison of vintage Schiaparelli Si cologne and a Lanvin extrait on different wrists, but I accidentally layered them on the same wrist. Suddenly, I was enveloped in a deep, soft olfactory fur coat of sandalwood! I had planned to do all sorts of errands that afternoon but all I could do was to laze about savoring the sandalwood and reading…. Great review, Kevin! Thanks so much for this review, and thanks to Robin for the suggestion to try it alongside Santal Blanc. Sandalwood is one of my favorite notes, it just makes me feel all warm and happy… but I hate Santal Blanc with a fiery passionate hatred: sooooo much cumin/curry, soooooo little sandalwood. I’ll give this one a lengthy testing period before I whip out the charge card to spring for a bottle. Robinhoo: you’re welcome…DO try SdM before buying! LOL- when dealing with perfume ad copy, a finely tunes BS Detector is essential! I really like Santal Blanc, but It’s not one I would buy unless I had a lot of spare cash hanging around. If Santal de Mysore is short on sandalwood I think i will skip it. Samsara is still affordable even in vintage. Flora…looking for a good vintage scent with sandalwood is a good way to get a mysore sandalwood “fix”. there were moments when i though u found it spectacular and then you dropped a bomb…. hongkongmom: I did find Santal de Mysore to be a lovely scent and would certainly buy it at a reasonable price. Maybe Lutens will run out of “real Mysore sandalwood” soon and reformulate SdM with another wood note or lesser sandalwood…what I like is the coconut-spices anyway in this one. This review totally makes me want to have it. And eat rice. And chocolate. And coffee with chcolate. I will not spent more then 90euro on perfume. Hello perfume industry, hello cosmetic industry, can you please stop ruin us? mybeautyblog: I know…if they ruin us they will not be selling many perfumes in debtor’s prisons! HA! Most of the time, I’d sniff at elaborate stories about note quality distinctions–usually, for me, the creative artistry of a blend always trumps the ingredients. Sandalwood is a different story. There is a distinct difference between older, Mysore essences and newer (Australian?) ones. My grandmother has always been a fragrance collector and she’s given me many special fragrance keepsakes to enjoy. I have some very old, but well protected and preserved Mysore Sandal oil that she recieved years ago from my grandfather (the 60’s or 70’s, maybe? I think it’s even older than that but I’d guess that’s when she got it). It had been stored in a glass vial, in a double wooden box, tucked into her boudoir drawer. It is the most enchanting stuff I’ve ever smelled. Amazing. Like sheer, cream pudding made with wood dust and champagne. It’s both dry-woody and creamy-fresh. Unlike anything else I’ve ever smelled. I think newer Sandal is just as beautiful, but often smells like an entirely different note; more astringent, drier and almost grassy. “Santal Blanc” is an interesting take on sandal because it plays-up the skintone quality of Sandalwood, while making it even more intimate by including yeasty/nutty/bready notes in the opening. There’s something about it that makes me think of a very “lived-in” house and bed. It’s a strangely addictive blend, even if not particularily pretty. Very carnal and casual. My first reaction was love and grab a bottle… And then after wearing it a few times at the comfort of my own home – it’s Arabie Lite. I love Arabie, but this one is missing the edge that Arabie has with the accent on the spices; and it’s more about “Mysore” and less so about “Santal”.